Also, it's really lazy to put most of the info in the title. Just put it in the post. They are merely decorational items, so there isn't really much detail needed to them in the suggestion, so this isn't necessarily vague for what it is, nor is it a wishlist. But let's say this actually lacked essential details... Would you just shout "VAGUE!!!!!1!1!1!ELEVEN!!! ", or would you actually ask for details, like blast resistance and whatnot? You need to add detail. Okay, fine, maybe it does lack one improtant detail, which, surprisingly, none of you mentioned, which is the fact that it didn't give us the crafting recipes. You guys really need to be less vague when you give criticism. Now, how do we craft these items? What is the wall you are talking about? Is it the cobblestone wall model? That would in fact be nice to have more of these! Pretty self-explanatory, not sure what's throwing people off. Definitely support about the stairs & slabs, not sure why they weren't included in the first place. As for pillars, would you also like to see stone pillars as well? Pretty self-explanatory, not sure what's throwing people off. The fact that it doesn't say the crafting recipe. Yep, that's pretty much it. I disagree as the idea is interesting but needs development. 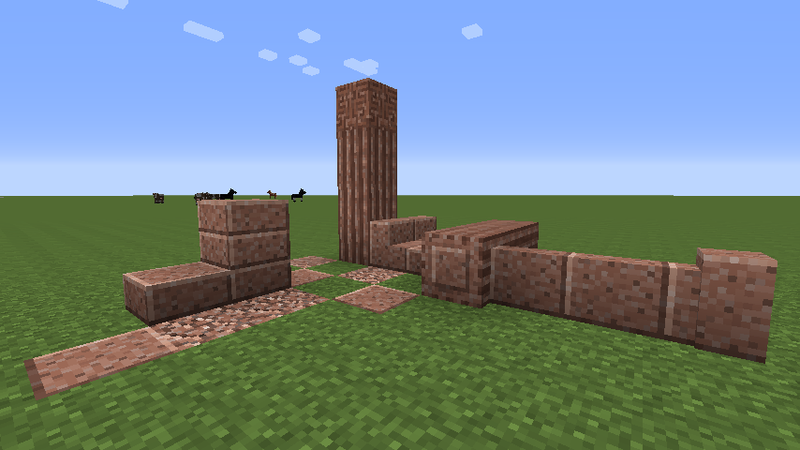 It would be nice to present textures for pillars and maybe even chiseled and double slab. As well as, should it be contained in a new block ID, or can it be in minecraft:stone's data value? And, can we make raw granite stairs or should it be only polished one? If we consider that granite, diorite and andesite in both raw and polished form, let alone other stones that may be added later on, it makes a lot of addition. Polished chiseled and pillars. 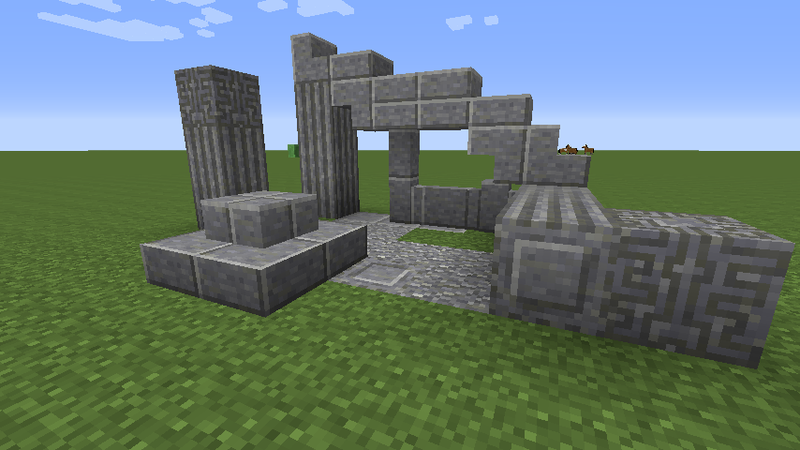 This fills 4 data value (0:chiseled, 1:pillar vertical, 2:pillar north-south, 3:pillar east-west), so it can be paired with four type of stones. Stairs. Since they take 3 bits of data value (0 to 3 gives orientation, +4 inverts it), so the fourth bit can be used to declare polished form. Slabs. Since they take 1 bit of data value (0 bottom and 1 top) we can use the 3rd bit for two stone type and the 4th shows polished form. Walls. We can use the same block ID as cobble stone wall, but I advise creating a new block ID so to follow the same pattern as stone (0 Stone, 1 Granite, 2 Polished Granite, 3 Diorite, 4 Polished Diorite, 5 Andesite, 6 Polished Andesite) and yeah! stone wall as well. So. total of new block ID: 1 chiseled/pillar (of 3 polished stones and an empty slot for future), 3 stairs (each with raw and polished version), 2 slabs (two stone types each with raw and polished version, and an empty slot for future), and 1 wall: 7! By having it polished granite chiseled and pillared, this fills 4 data value (0:chiseled, 1:pillar vertical, 2:pillar north-south, 3:pillar east-west), so it can be paired with four type of stones. Then we have stairs. Since they take 3 bits of data value (0 to 3 gives orientation, +4 inverts it), so the fourth bit can be used to declare polished form. Then we have slabs. Since they take 1 bit of data value (0 bottom and 1 top) we can use the 3rd bit for two stone type and the 4th shows polished form. Then we have walls. We can use the same block ID as cobble stone wall, but I advise creating a new block ID so to follow the same pattern as stone (0 Stone, 1 Granite, 2 Polished Granite, 3 Diorite, 4 Polished Diorite, 5 Andesite, 6 Polished Andesite) and yeah! stone wall as well. So. total of new block ID: 1 chisel/pillar (of 3 polished stones and an empty slot for future), 3 stairs (each with raw and polished version), 2 slabs (two stone types each with raw and polished version, and an empty slot for future), and 1 wall: 7! Good point. (Also, sorry for forgetting those other details, I've only slept 6 hours. I really wish these would be added, but your post is insanely lazy. Don't use your title as part of your suggestion, use it to sum up or introduce your suggestion. Made a mock up of your request. what do you think? I just made a quick 1.7.10 mod of it to see what the textures would look like. ill probably start on a 1.8 version soon. 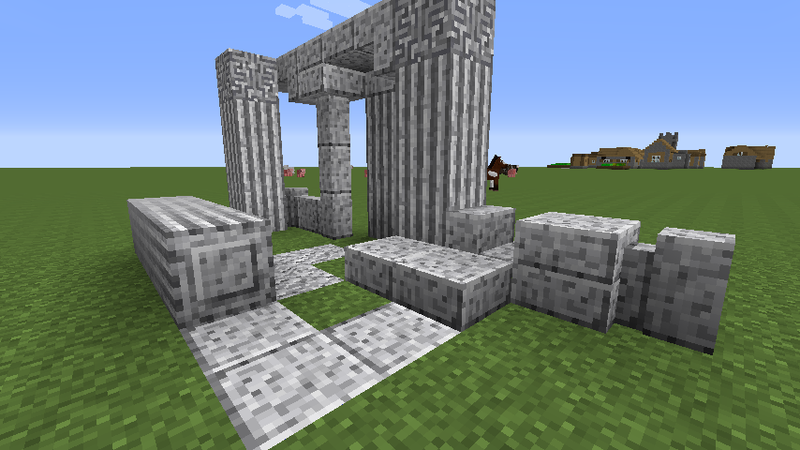 Those textures look amazing; especially the Diorite pillars. Which makes it a wish-list. 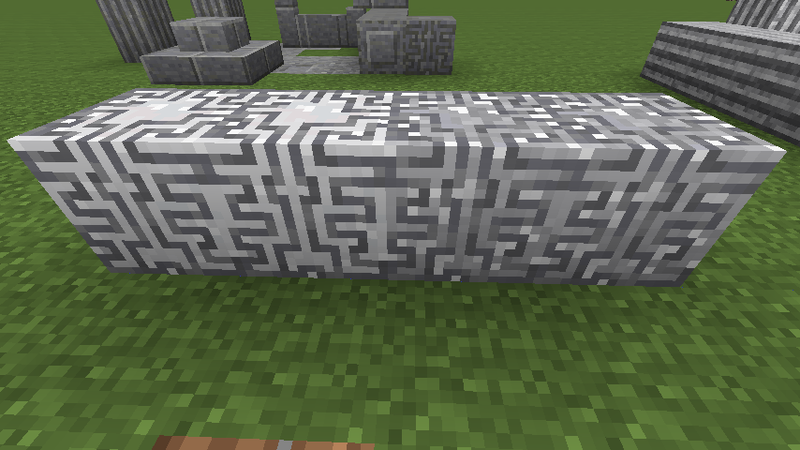 Which texture for Chiseled Diorite do you guys like better? Left or Right? Light or Dark?